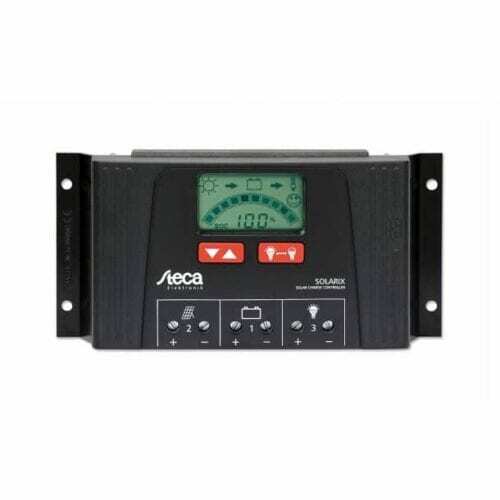 The Steca Solarix 2525 Solar Charge Controller 12-24V 25A is a newly developed product based on the internationally renowned controller family Steca PR. With increased module and load current, the controllers are now also suitable for even larger systems. The Steca Solarix 2525 Solar Charge Controller 12-24V 25A also feature an integrated USB charging port for charging smartphones and tablets. Use of the latest charging technologies combined with state of charge determination enable optimal battery maintenance and module power monitoring. A large display informs the user about all operating modes with the aid of symbols. The state of charge is represented visually as a level meter. Data such as voltage, current and state of charge can also be displayed digitally as figures on the display. In addition, the controller has an energy meter which can be reset by the user.